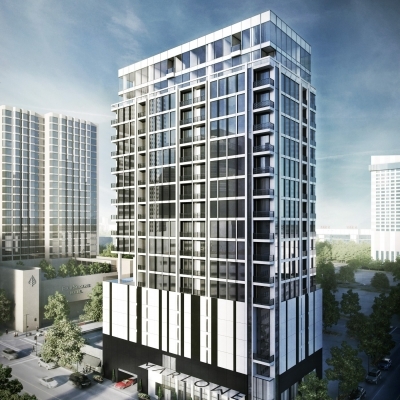 Rendering of Marlowe condominium project under construction in downtown Houston. LEGEND: RESIDENTIAL PROJECT OF THE YEAR – Marlowe condominiums by Randall Davis with DC Partners. Houston multifamily developer Randall Davis is a trendsetter, spotting opportunities long before the pack. There are thousands of new residential units coming online in the downtown Houston residential initiative, but they are all for-rent apartment projects – except one. It’s Marlowe, a 20-story, 95-unit project by Randall Davis Co. and DC Partners. Davis believes the condo market is deep enough for a new downtown project. Prices range from $375,000 to $1.5 million. Marlowe is tapped into the EB-5 federal program that grants visas to foreign investors. Randall Davis was the key player years ago in popularizing the loft redevelopment trend. Early on, Randall gave me a tour of a historic brick warehouse north of Buffalo Bayou that he was turning into lofts. The interior units were supported with massive wooden beams that were essentially old-timber tree trunks with the round part squared off. Randall, with his own edgy style, has a Trump-like genius for branding and marketing residential projects. One of his project’s avante gard lobbies was decorated with a large photo of Mick Jagger and Tina Turner making out and drinking champagne straight from the bottle. With some more experience under his belt, Randall moved on to tackle the Mount Everest of historic redevelopment in Houston – the Rice Hotel. The hotel, once the grande dame of Houston hostelries, had been boarded up for decades. Many would-be developers had examined the potential of the Rice and passed on it. It was too tough. The hotel shut down in 1977 and it became an eyesore and finally, a disgraceful urinal for street people. The Rice was located on Texas Avenue, right across the street from the Houston Chronicle, so I was asked about its fate constantly. The Rice was built in 1913 on the site of the former Capitol of the Republic of Texas. President Kennedy visited the hotel the day before he was killed. Basically, the Rice Hotel was sacred ground. In 1995, Randall got control of the Rice, brought in Post Properties, redeveloped it and reopened it as the 300-unit Rice Lofts in 1998. Since then, Randall has completed a number of redevelopments and new residential projects in the Inner Loop of Houston, with additional developments in Las Vegas, Galveston and South Padre Island. For what he’s doing with Marlowe, for what he did with the Rice Hotel and for the way he changed Houstonians’ perceptions about urban multifamily living, Randall Davis wins a Realty News Report’s Legend of Real Estate Award. Coming Monday: Realty News Report’s Legends of Real Estate Award for Retailer of the Year.